At Kraft Davies, PLLC, in Seattle, Washington, we represent residential and commercial construction workers who endure risky environments on a daily basis. When failure to heed construction industry safety standards or simple common sense results in serious, life-threatening injuries — such as being run over by forklift, falling into an excavation or falling off roof. Contact us at 206.624.8844 for a free consultation following a serious construction accident. Injuries from falls — A fall from a scaffold can result in a serious, career-ending injury. Workers have died following a construction accident of this nature. Our job is to see that the negligent party is held accountable. Burn injuries — At Kraft Davies, PLLC, we know that even the most experienced electricians can suffer shocks and burns or electrocution on a jobsite. Unsafe working conditions are usually the culprit, mandating that you retain experienced legal representation. Crane injuries — When crane safety is not made a priority by a construction company, workers can get badly hurt or killed. The inherent risks involved combined with negligence can spell disaster and an end to a productive career. Trench wall collapses — Physical and emotional damage can result from a frightening trench wall collapse. Many professionals rank them as one of the most harrowing types of construction accidents. If you have been hurt or traumatized in a trench wall collapse, do not hesitate to contact our firm for a free initial consultation. Construction site explosions — Dangerous conditions are common on construction sites. Add to that a lack of attention to basic safety procedures and you have a recipe for disaster. Construction site vehicle injuries — A rush to deliver materials or complete a project can result in vehicles moving too quickly on a construction site. The consequences of a dump truck injury can be deadly and fault may be placed on you. 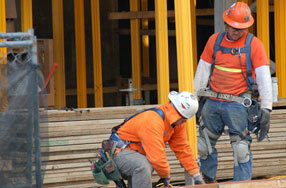 Let a seasoned construction accident attorney sort out the facts from the fiction. Construction falls — Scaffolding is only one of many places where a fall can occur on a construction site. Unsafe conditions can lead to falls from high places. In a split second, your career could end — and a life of pain and suffering lie ahead. Heavy equipment injuries — Heavy equipment is a fact of life on a construction site. However, when that equipment is poorly maintained or carelessly operated, you could suffer serious injuries. For more information or to schedule an appointment with an experienced construction accident lawyer regarding jobsite injuries, please contact us or call 206.624.8844.